Did you know British Columbia has a legendary creature that has baffled scientists, environmentalists, and curiosity seekers over the years? Bigfoot is a large hairy creature resembling an oversized monster gorilla, that walks on two legs like a human. Sometimes called Sasquatch, from the Sts’ailes word “Sa:sq’ets” which means wild man, reported sightings in the province go back about 200 years when the early settlers had encounters with this mythological animal. The big question is whether an elusive gorilla-like creature is wandering around British Columbia, or if there are practical jokesters behind the sightings. Many sightings have taken place in the Fraser Canyon region, with one of the latest in the Mission area in July 2013. Bigfoot is known to be most active between Harrison Hot Springs and Hope, and has also been sighted at several locations on Vancouver Island. Witness accounts range from seeing huge footprints, hearing unknown howling noises, and sometimes the elusive creature is seen moving through the forest, bathing in the river, or killing livestock for dinner. Sasquatch is usually rather shy, running off when spotted or if a camera comes out. It is not known to be vicious, not known to prey on humans as food sources, but there have been reports of people kidnapped by Sasquatch who later escaped to tell the tale. 1. Walks on 2 legs. 2. Stands anywhere between 6’ and 10’ tall. 3. Weighs around 500 pounds. 4. Gets its name from the footprints it leaves behind – close to 2’ long and 8” wide. 5. Master of stealth. No human or animal moves as quickly and quietly through the woods as Bigfoot. 6. Expert “hide & seek” player. Bigfoot hides well in the thickly forested areas of British Columbia. 1. In 1864, Alexander Caulfield Anderson, a Hudson Bay Company fur trader and explorer, and his party were attacked by hairy humanoids who stood on a cliff and threw rocks down at them where they stood in the Fraser Valley Canyon. 2. In 1911 at Harrison River a fisherman spots a large hairy creature drinking from the river. The creature ran off when it realized it had been seen and left behind 17” footprints. 3. In 1933 at Pitt Lake, two men using binoculars spot Sasquatch eating berries. 4. In 1957 near Hope a truck driver saw a large hairy creature vault over a fence and then head towards the Fraser River. 5. In 1970 near Harrison Hot Springs, Keith Shepard sees an 8’ tall Sasquatch cross the road in front of his car. 6. In 1986 a family on vacation in Granite Creek feels something heavy slam into their cabin. They saw a large Sasquatch-like creature run off into the trees, leaving behind footprints measuring 17” long and 6” wide. 7. In 1997 Wayne Oliver video tapes a possible Sasquatch near the Fraser River at Hope. 8. In 2004 BCTV reported two women driving near Tofino narrowly missed hitting a Sasquatch that stood in the road in front of them refusing to budge until other cars approached, scaring it off. 9. In 2013 Global News reported a group of Chinese tourists saw Bigfoot and took photos and video. 10. In 2014 Global News reported a video shot near Whistler might be Bigfoot moving effortlessly through deep snow in a remote area. 1. 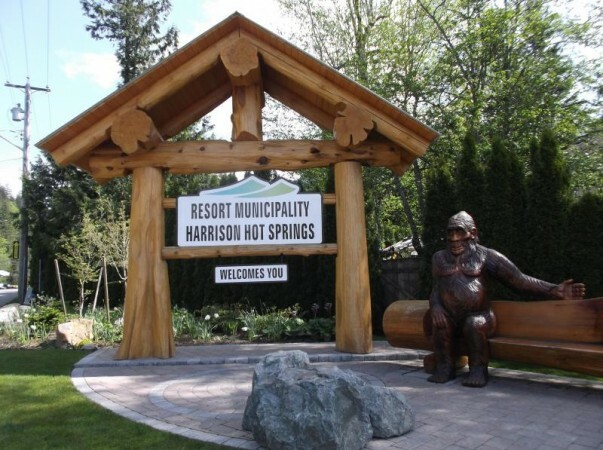 Harrison Hot Springs and the surrounding areas seem to be a hotbed of Bigfoot activity and is the best place to pick up Sasquatch themed souvenirs. 2. Pitt Lake is the 2nd largest lake in the Lower Mainland, behind Harrison Lake. Is there any coincidence there have been numerous Bigfoot sightings around these water areas? Besides looking for Bigfoot, Pitt Lake is a popular place for boating and fishing. This is a great place to bring a picnic and enjoy the breathtaking scenery of Pitt Lake and the mountains. If you’re feeling energetic a vendor rents canoes to paddle around the lake and explore possible Bigfoot grounds. 3. Mission had Bigfoot activity in 2013 that received a lot of international attention but mostly tourists come here to camp or enjoy ATV or 4 wheel driving on old logging and forestry roads. Visitors can also tour Westminster Abbey and BC Hydro has a visitor centre at Stave Falls. 4. Whistler/Squamish area has had a few Bigfoot sightings over the years. In addition to trying to catch Sasquatch on camera, tourists enjoy the year-round outdoor adventures this area offers such as skiing, rock climbing, hiking, mountain biking, and riding ATVs. Over on a turn out for a nap. There was a sign of the local are near a bridge i put my seat back and was drinking som water when some moose ran pas l sat up and watched themwhen they got near the bridge they stopped and looked back as if they were waiting for others to catch up. I looked back the road and seen 2 dark figures coming up the road. They were on all 4s and I was thinking it was just black bears. I watched the smaller one come in back of my car and stroll down a rivean and lost sight of the other. After a few minutes i felt my car shack I was thinking a bear was rubbing against my car so i sounded the horn. I leaned back in my seat ready for a short nap. I am not sure how long I was sleeping when some twigs about 2 inches long landed on my wind shield I looked around and thought they were swept up with some wind. I sat back and closed my eyes when I herd the sound of twigs on my car window again. I got out and cleaned of the twigs and noticed they were freshly broken now some kind of animal or person throwing twigs was the last thing on my mind. I was sitting up when i seen twigs come from under the sign. I kept looking in the area and a little while again more twigs from the area of the sign. I seen the 2 figures move in the bushes in front of me I became unsettled and desided to move on. As I start to leave i seen a huge black figure coming in my direction. Its arms swinging and seemed to be walking with a purpose it crossed the road and a smaller one came from the area i was just parked. I got out of my car and walk a few steps kind of stunned with what i was seeing I wanted a better look. Thee larger one stopped staired back at me and made a loud huff at me I got in my car and drove off a little confused at what just took place. Wow! I should be tagging along with you! Bigfoot do seem to like to throw things. Playful? The loud huffing noise is documented by others who’ve seen Bigfoot. Fascinating. Thanks for posting that account, Nicholas. A fascinating family sighting. I’ve never actually seen a sasquatch, but I did get “huffed” late one pitch-black night when I disturbed something big alongside Rockwell Drive near Harrison. Your word, ” huff” , captures that sound very nicely. I took it to be a warning, like a dog’s growl, telling me to back off. I’m quite familiar with horses and how they snort. Based on that, I felt there were some very big lungs behind the sound. It was very deep and strong. Your right it was a picture perfect minute and all I had was an outdated flip phone at the time. Yes the huff was a warning it felt as that huff came deep inside the chess. I am very familiar with horses as well nice hearing from a fellow horse person. Also, Bill Miller runs “Sasquatch Country Adventures” in Harrison. ( Ph 604-796-5570. )He is very knowledgeable and conducts ATV tours of the back woods. There is also a good selection of books on the subject available in Harrison, mostly by local resident John Green. Hey I’m from hudsons hope and my dad had an encounter at the same spot a few years back we recently go out researching thanks for posting ! Had a sighting in 1976 approx. Taking 3 steps to cross a 4 lane road in a new subdivision in Campbell River. Since then have moved to the Nanaimo area where many sightings have happened. In the Nanaimo lakes area(s)and on the out skirts of town. One of the latest sightings happened on the back side of Newcastle Island by someone on a sailing boat; that person has kept this info silent. She is a believer now. To all of you that think they are all hiding in the deep dark forest, think again. The proof is out there even if a few keep crying hoax. I have had three personal contacts with Bigfoot, near Hope, BC (1997, 2015,2015) and another person had a sighting on the same property in 2002, along with another possible encounter in the fall of 1999, near Radium Hot Springs. I have had gifts left for me in one night (two sticks, one of which was placed under my car inside a gap in my bumper- after thinking when I went to bed, “do something to my car”). I have also seen a juvenile one, for a split second, about 8 feet away from me, bent over looking in the low bushes. I have also received wood nocks returned. I also had a sighting east of Canmore. I have had 3 experiences and 2 of them were sightings the other was about 2 am one night when I was our back packing. I had branches tossed at the shelter where I was sleeping. I know there was no people around because I hiked for a few hours and do not think a person would be walking threw the forest with out a light. Jody, you seem to have found all the popular Bigfoot habitats. It’s a fascinating topic. I would love to chat with some of you that have had sightings. If you are in the Harrison Hot Springs/ Hope area. We are interviewing witnesses for a documentary airing nationally 2017.
cherylle; There are still many that don’t believe in the ground burrower(bigfoot}. Gifting with real food will be a suggestion for you. Remember as there are good bigfoot out there and there is the chance there are anger ones out there, too. My experience with them here in Nanaimo has been interesting and good. I haven’t been to the hut area for sometime. Been trying to keep up with the different info of this area, though. Always have food if your going out in the woods as offerings, that’s my opinion. Myself and 2 friends had an encounter, with what we believe was sasquatch, in the Hope BC, area. We were 18 years old or so at the time, but I’m willing to share my story with you. I’m not a crackpot, but have held onto my story for many years. I also had two different encounters with saquatch in the Chehalis area.3 of us got stuck in the snow and had to walk out at night in a snow fall and it followed us down the mountain breaking branches and once well shooting we had three surround us grunting and branch breaking. Michelle, that sounds like it would have been a scary experience. Snow, night, and being chased! Yikes! I’ve followed the Sasquatch phenomenon since the early 1960’s when I got a book by John Greene. Recently I had a sighting and after a long time looking. Sunday January 8th 2017 at about 4:40pm, about twelve to fifteen minutes out of Westbank Greyhound bus depot and very near the Brenda mines area along the Okanagan connector. He was just standing in the ditch along the northbound lane(s), as I was riding in the bus to Merritt. Absolutely beautiful and perfect in form he seemed to be waiting for traffic to pass, so he could cross. Most prominent features were, no neck, a crested head, snow on the crest and snowy shoulder epaulets. I was approached to create an idea or theme for Harrison and suggested they use the Sasquatch. I drew up 4 concept drawings and they were presented to council. I contacted Master carver Pete Ryan and also contacted Pioneer log homes to create the structure. The Sasquatch is captured in photo’s here everyday and it’s at least a sighting for some tourists. Hi there, I had something happen to me in chilliwack bc that scared the hell out of me last year of 2016. I’m a big fishermen, I’m always up at the vedder fishing. I was up fishing one morning at the vedder river in chilliwack bc. It was late October foggy rainy day. That year I stared following up on bigfoot and doing some research, the topic interested me so much just cause I’m out on the river so much. Anyways .. one morning I headed up to the upper part of the vedder river maybe 3-4 mins pass Alison pool. I get to my spot start putting my waders on at my car and across the road there’s a old trans Canada trail that’s no one uses. It’s a super small trail that goes right into the woods towards the us. The trail does have warning signs saying it’s dangerous. When I was putting my waders on I noticed there was a interesting x pattern that I could see kinda in the trial. So I crossed the road and entered the trial. I did not walk far in just because it was 730 in the morning and I was the only person up there so it felt creepy. I was standing by the x pattern looking at it and looking into the forest. It was Completely quite so I picked up a solid stick and started to do some wood knocks right by the x pattern. Did a couple knocks and didn’t get any responds back but in my mind I didn’t believe that anything would ever happen. I did couple more after and nothing so I stood there and just listen and looked around. Didn’t hear nothing or see anything so I said screw it let’s walk in deeper. Right when I started to walk in a tree comes flying down across the trail. It wasn’t thrown it was a tree rooted in the ground that was pushed by force. When this happen I completely froze and went into shock I couldn’t move or do anything. It was so loud when that happen I was about 20-30 ft away from the tree that got pushed. I screamed hello is anyone there thinking maybe someone was there hiding trying to mess with me But there is no way it 730 in the morning not a car or person insight. I looked around quickly and ran out of there scared as hell. That trail is covered in sticks an dry leafs. U would hear someone walking or coming up. I didn’t hear anything the whole time I was there. I’ve never been back since but I do still go there to the fishing spot, I did notice the x pattern isn there anymore.